I started sewing way before I started paper crafting, so I'm pretty comfortable cutting fabric with a ruler and a rotary cutter. When I first started paper crafting I used some of the same plastic rulers and my rotary cutter. Turns out they don't work so well with paper. So when I got a chance to work with the Perfect Ruler, I wasn't sure how I would fare. I was happy to find that the metal edge of the ruler works fantastically with an Xacto knife. Love the crisp cuts it gives. Plus it has this gripper thing that stops the ruler from sliding around (another must when working with a sharp razor). Here's a close up of the cuts. 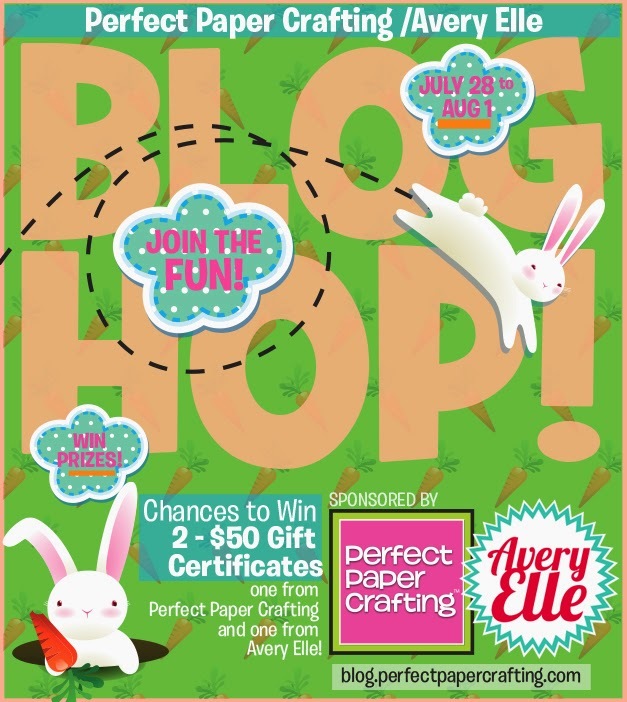 Don't forget to check out the Perfect Paper Crafting Blog and leave some comments on all the blog hop stops to get entered for a fun prize! Hope you have a fantastic day! Cool card, JJ. Oh my, I think I shy away from the "looks easy but harder than it looks" techniques and go more for the "looks hard but easier than it looks" ones. LOL. TFS your new ruler. I love new tools. Fun papers and sentiment stamp! The ruler sounds like a great tool for cardmakers! Love your card! Love both companies and their products. I love your card, really quite bright and colorful! This is quite a fun look with a unique design - thanks for sharing! I love the layers on this! Very cute design! Nice design. Great balance of color, pattern and white. Love your choice of papers and great design. Great card JJ. I love the layers and paper you used on this one. Ack! What a great way to use paper - gorgeous!!!!! this card is so colorful. I love all of the layers and different designs. would also be a way to use up some of the scraps that accumulate. Thanks for sharing a great card. What a sweet card! Love the way you did the banners! Really cool video on that Perfect Ruler!! Want that!! Amazing layering, what a great idea. Love the colors. Awesome layering! Thanks for sharing info on the perfect ruler too! Loooove those papers! Awesome display of them. This looks like a lot of math/measuring was involved...hehe...sweet design. it's a beauitful card, I love this mega banner! Loving this pieced/layered pennant. So cool! Is it Saturday day??? You are so clever, JJ! 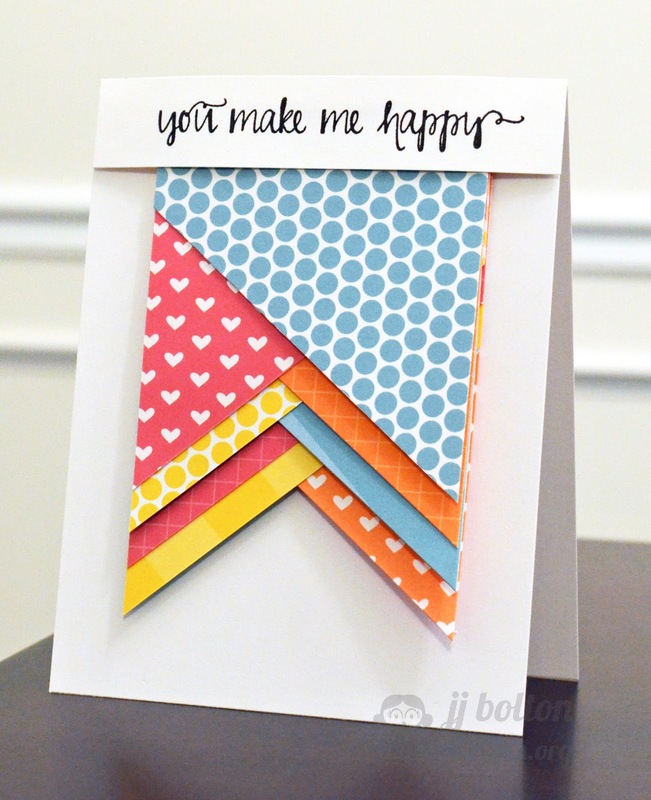 Working with all of those angles and cutting them perfectly is what makes this card so special! I love how you mixed the patterns and colors of these beautiful AE papers, too! You never cease to amaze me...WOW! Love how you stacked the banners and your paper choices. The sentiment banner looks great. Love how you overlapped it over the stacks. Very creative. Your a genius!!!!! This is amazing and such a creative idea. Your awesome! 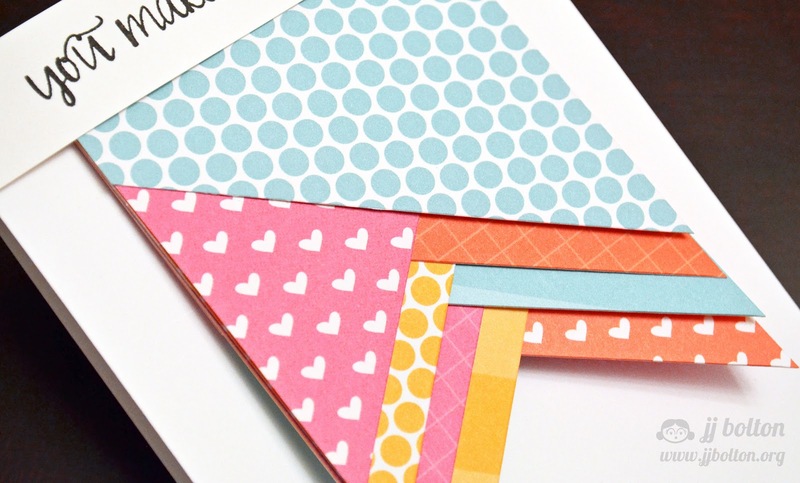 Such delightful and adorable layers in your wonderful card!!!! What a great idea. Love the stacked banner. WOW - AWESOME card JJ - LOVE the sweet sentiment and layers!!! Amazing, beautifully executed card...love the perfect layers. Fantastic card. I love all those stacked layered in the fishtail banner. JJ, this is sooo cute! I love those banners with those fun papers! LOVE LOVE the layering! The papers are fantastic! Your cards are always so awesome! Great job!